Mead is a fermented beverage made from honey. Mead can also contain fruits, spices, sugars, hops, vegetables, caramelized honey, maple syrup and some is also wood aged. Mead is an old beverage, with evidence of mead-like fermentations going back almost 9000 years. Every culture that has existed on Earth has celebrated or been influenced by mead. Mead comes in many styles and several different formats for service. Explore the sections below to learn more about the different types of mead. For more information on the sensory evaluation of mead, cider and wine visit our Sensory Training page. For tips and information on making mead visit our Meadmaking page. Traditional meads are made with a limited number of ingredients, only honey, water and yeast. These are sometimes also called show meads, and come in different strengths that also have their own words and names. Standard – a Traditional mead made typically to wine strength and ranging from dry to sweet in the finish. Meads made with fruit are called Melomels. There are several styles of Melomel that have their own names, including Cyser and Pyment. The fruit can be fermented, added after fermentation, or both. The form of the fruit can be whole fruit, juices, purees or concentrates. Meads made with combinations of different fruits can be beautifully complex, and truly more than the sum of their parts. Melomels made with apples or cider are called Cysers. When making a cyser a meadmaker might use fresh apples to lightly flavor a mead or use cider or apple juice instead of water when create the starting liquid to ferment. Cysers are very popular because the apple aromas and flavors or so widely known and enjoyed. Melomels made with grapes or grape juice are called Pyments. Meads made with grapes can come in a number of forms from those flavored with grapes to meads that really start out like wines with honey added to increase the amount of sugar in the fermentation. Pyments can be dry, semi-sweet or sweet and many of the best ones are made from a blend of grapes that present a good deal of complexity that one grape alone may not have. Meads made with herbs and spices are called Metheglins. There are so many different spices that can be used to make mead including vanilla, cinnamon, ginger, lavender, basil, coffee and tea to name just a few. At Ancient Fire we like two spices in particular, chili peppers and hops. The spices may be added at the beginning of the fermentation or afterwards, and may be applied as dried spices, extracts oils or made into a tea before addition. Meads made with chili peppers are often called Capsicumels, named for the Latin word for the genus of plant from which chili peppers come, Capsicum. Fresh chili peppers when steeped in mead impart both chili pepper flavor and heat. Dried peppers generally only impart heat. Super hot peppers can be used in mead, but even the relatively low ABV of some meads can quickly work to infuse the heat of peppers into the liquid. Be careful! Hopped meads can be really special, drawing on the unique attributes of both mead and hops, the aromatic plant most commonly associated with beer. In brewing hops are used to produce three different outcomes, bitterness, flavor and finally aroma. Hops can be used this same way in meadmaking, but traditionally only aroma, and sometimes flavor, are sought they way hops are applied. Typically when using hops in mead they are dry hopped, the last stage of hopping in the beer-making process. Dried hop flowers or dried pelletized hops are added directly to the fermented mead and allowed contact time to infuse aroma and flavor into the finished product. There are so many hops to choose from, and with a huge range of aromas to work with the possibilities and combinations with other ingredients are limitless! Braggot is the name used for meads that made with both malt and honey, and typically served like beer. 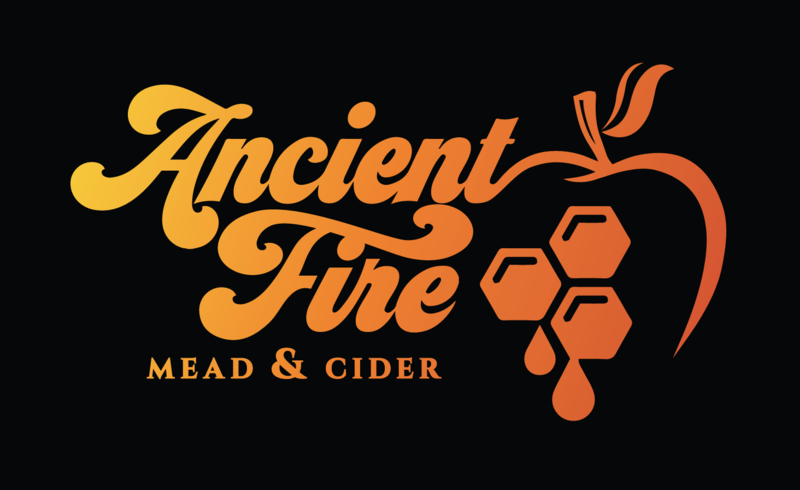 As a winery Ancient Fire can’t legally make this type of mead, but we can collaborate with local breweries to make braggots for everyone to enjoy! Meads made with other fermentable ingredients like maple syrup and other sugars, those that contain caramelized honey or those that may have been made with non-traditional processes. A particularly interesting experimental mead, called a Bochet, is made with intentionally caramelized honey. Typically honey is no longer heated beyond using hot tap water to get it mixed. In a Bochet you are actually heating it to the point that it will roll, simmer or even boil which gives it caramel and toffee notes. Yum! Wood aged meads can be derived from any of the other styles, but later in their production they are aged with some type of oak adjunct (chips, cubes, spirals, staves) or in an oak barrel. Barrels may be new oak or those previously used for wine, whiskey, Port, Sherry or other spirits. Adventurous meadmakers even use other types of woods for aging! Draft meads are meads that are typically made to be served and consumed much more like cider and even beer. Lower in alcohol, carbonated and served chilled from a tap. These are also sometimes called session meads. At Ancient Fire we like to call these Crushable meads. Dessert style meads are those that are presented in both wine strength (12-15+% ABV) and are also sweet like a dessert wine like Port or Sauternes. The Mead Industry is Growing Fast! Infographic provided by the American Mead Makers Association. Click to open a larger version.